« Saving the Baby- The Mosquito Way! Simply waiting, excited at the prospect of a show never before seen, yet hinted at. Attendants with their glow sticks waving people to the left or right to fill the spaces. All paled into insignificance as the proud and spirited horses arrived. and humour and love flowed between the two. From humour to a stately pas de deux, two sisters and their almost identical horses mesmerised with their precision. Left one breathless with anticipation and awe. The absolute trust between horse and rider was apparent. Exciting races around an oval ring allowed everyone to see the grace and power of these beautiful animals, and the superb balance and talents of the riders. Incredible dexterity, magic was in the air. The love between horse and rider was obvious. Frederic Pignon and his wife Magali Delagado are the Co- Founders training the horses. The other two Co-Founders are Normand Latourelle: President and Artistic and Director Erick Villeneuve. 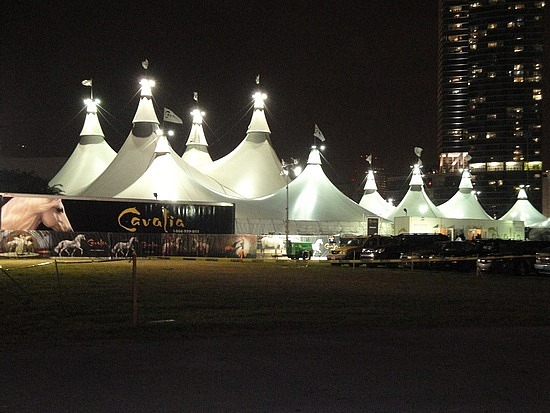 There are 44 horses in Cavalia, 19 stallions and 28 geldings. 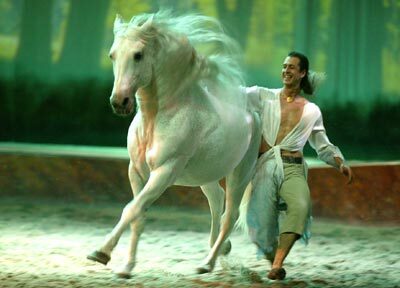 The horse breeds comprise Lusitanos, and the remainder are Andalusian (PRE), Canadian Horses, American Quarter Horses, Paint horses, Belgians, Percherons, Arabians, and Appaloosa. The show’s horses were originally from Canada, France, Spain, and the United States. They are beautiful, powerful and yet were so gentle with their riders. There is a love and synchronicity between them which makes the heart swell. I couldn’t pass up such a wonderful opportunity to talk about the wonderful show I’d seen. Horses trained with love – and it showed. I am so grateful that my husband, Ray, surprised me with this outing. Our beginnings were rocky, literally, since the wheelchair he hired to save a painful walk, was an exercise in finding new ways to add bruises to my frame. Counters for merchandise were a foot above my head (I was supposed to save money by not being able to see – quite a laugh), and once again I found that being in a wheel chair meant I was invisible to the people around me. I lost count of the number of people, man women and children, who walked or ran into the chair. I was beginning to wonder if the saving in walking had been worth the experience of being unseen. However, I was more than grateful that I didn’t wear any of the wine, beer or soft drinks being carried around, as they inevitably flew in an arc when the owners realised I was there. I hope you enjoy these few images (cameras are not allowed inside the Big Top) and if you love horses, as I do, it may have whetted your appetite to go see the show whilst they are here. Your hands and your heels hold low. Your elbows close to your own. Amazing show, truly. I grew up with horses and to see them having so much “fun” while hard at work was incredible! Power and precision in a performance of passion! As for the people and the wheelchair, being the ‘pilot’ was a challenge and my frustration level was intense. I just wanted to run down those ignorant, arrogant so and so’s that stood with stupid expressions like lumps of clay while we tried to navigate through and around them. That would just have been another bump for Susan though. Meanwhile, I am designing a bumper bar for a wheelchair… And air horns…!